Griffith Owen was born in 1759 and died in 1829. 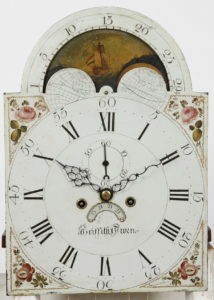 He apprenticed to Jacob Godshalk at the age of 14. There was a family connection facilitated by the fact that Owen’s older sister Elizabeth was married to Godshalk. 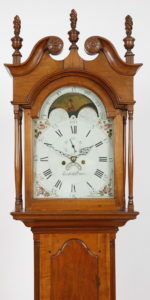 In the early 1780’s, Jacob Godshalk died and Griffith Owen took over the clockmaking business where he continued in Philadelphia up until the mid 1790’s when he moved to Towamencin in Montgomery County. Starting in 1802 and continuing till 1814, Owen advertised in the Philadelphia Directories. He died in Norristown in 1829. 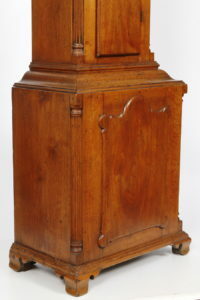 This example is a bold Chippendale case with carved rosettes, tombstone shaped wasit door, fluted quarter columns and applied “turtle” base panel flanked by fluted quarter columns all resting on ogee bracket feet. 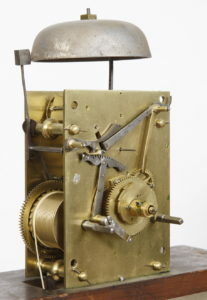 The clock is a remarkable state of preservation retaining it’s original dial/works/weights/pendulum and even the winding crank as well. 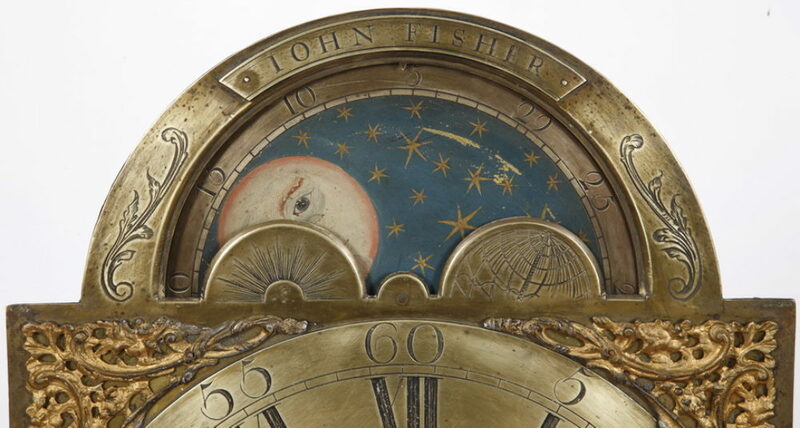 The eight day brass striking movement is coupled to a 12 X 17 inch painted iron dial with lunar phase and calendar subsidiary dials. The Walnut case has been refinished and has a warm rich patina. 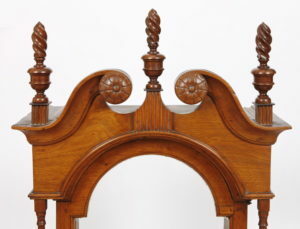 The feet are original is minor repairs to some of the blocking, and the finials are appropriate old restorations. 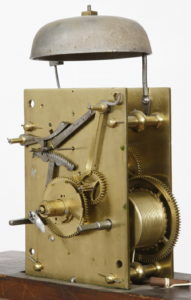 The clockworks have been professionally conserved and the clock runs, strikes and indexes perfectly. 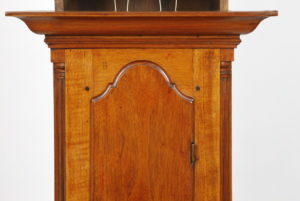 The clock stands at 94 inches tall.